This is just a small sampling of the way I, as a self identified member of the #hashtagkids gang, conveyed emotions, thoughts and yes, even research this past weekend at NEXT2016 in Nashville. For those that aren’t familiar, NEXT is an annual conference put on by the American Physical Therapy Association (APTA). It is intentionally smaller than Combined Sections Meeting (CSM) to allow for networking and deeper conversations about our profession. That said, this was still the largest national conference I had ever been to and it was an absolute blast. Susan Clinton‘s candid warning, “You guys know we’re talking poop, right?” Followed w/ very practical info for talking poop with athletes. For example, did you realize that when you feel the urge to poop and then don’t, the feces can retropulse? Fun, icky stuff right? So when you feel the urge to go, GO! And toileting position matters! Truth told, the session from which this photo came from wasn’t a ‘first choice’ for me. Both Zachary and I were hoping to attend the Rothstein Roundtable, but as it turned out, by the time we arrived, the room was at capacity. We ran around looking for another session and ended up in ‘Health Behavior Coaching Skills for PTs and PTAs’ with Janet Bezner, MarySue Ingman, and Beth Black. As fate would have it, this ended up being one of my favorite sessions and one that has already had the most impact on how I approach patients in the clinic. There were so many clinical pearls and ‘ah ha’ moments that Zachary, his brother Tim (shoutout #DPTstudent) and I had this slight Twitter blunder when we all managed to tweet the exact same thing. Taking a break after day one of the conference to recharge doing what I do best at Climb Nashville. This was super important to me, because as a #freshPT, sometimes it’s hard to find balance between wanting to learn, grow and be a super badass physical therapist and on the flip side, maintaining my sanity and personal relationships. I moved to Chattanooga with the sole intent of having access to climbing so part of my “why” is maintained by cramming my feet into small shoes and chalking up. 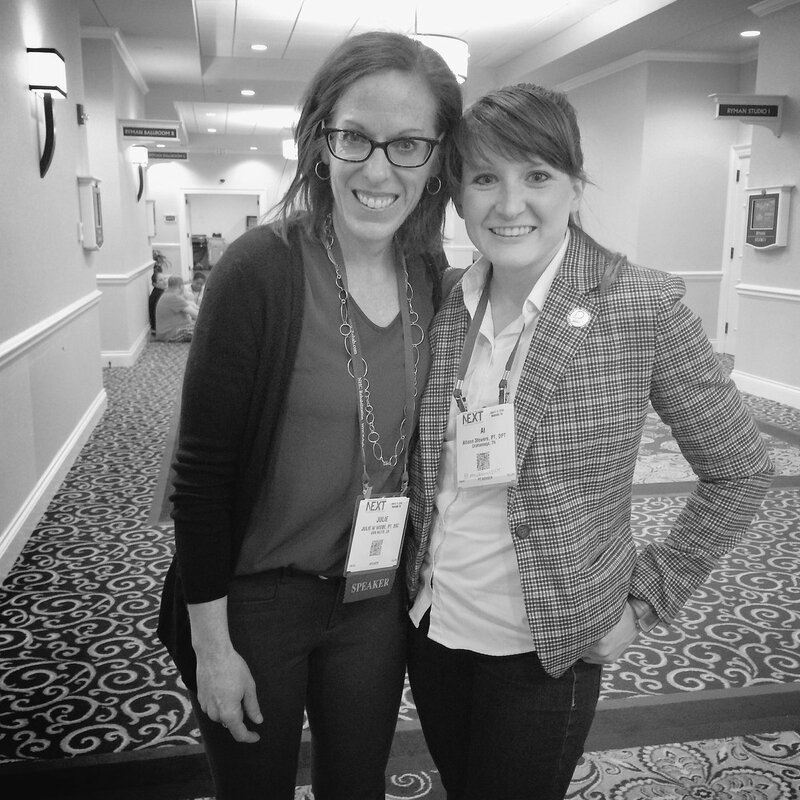 Meeting my #pelvicmafia idol Julie Wiebe and feeling like I’ve known her for ten years after a ten minute conversation. A little over a year ago, I had a clinical instructor within the VA system charge me with three things: a) get involved in physical therapy’s very active Twitter community b) find another PT who inspires you c) tell us about it. I gave an inservice at the end of that clinical about all that I’d learned from Julie Wiebe’s online course and how we could apply the pelvic piston idea to our female veterans. What I learned in that course has set me on a trajectory in practice that I’m really excited about. Here at Peak, I treat female athletes and I find it pivotal to treat my climbers, triathletes etc. as more than just a floating shoulder or hip. Learning and networking to return back home full of fire & excitement and feeling like a better clinician than I was last week. I feel like it can be so easy with looming student loans and a full patient schedule to get complacent in practice. While my own clinical experience in and of itself will help to mature me as a therapist, NEXT provided me with the culmination of experience from clinicians all over the United States in all different settings who are involved in teaching and research. Being a member of the APTA helps me to keep a pulse on the direction and gives me tools to grow our practice, while finding ways to plug in to the profession ensures that I go beyond complacency and continue to have my practice challenged to patients with the best care possible. ← Is this thing on??? Excellent recap – I almost feel like I was there with you and feel more impassioned about our profession through you! You’re such a compassionate and well-rounded person and clinician, and I’m proud to have you as a colleague and dear friend! Thanks so much Katie! It means a lot coming from you! Trying to convince one of my colleagues to attend Ascend2016 and live tweet. Would love to see the content out of that conference!